An urban beach refers to an artificially created space in the city that looks and feels like a natural public beach. One big difference is that with an urban beach you cannot go swimming or enter the water. Urban beaches are often used when access to water is either not available or not advisable. The idea of the urban beach as a summertime public amenity in the middle of the city is not a new idea. 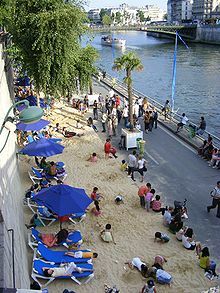 One of the first Cities to create an urban beach was Paris, France with the Paris Plage. During the summer months, the city of Paris actually closes the road adjacent the Seine River converting the space to sand, beach volleyball, music - a place to enjoy a beach atmosphere in the heart of the city. Closer to home, there are four recent examples of urban beaches including two in Toronto, one in Montreal and one in Ottawa. These beaches provide a place to relax in the shade of an umbrella and enjoy views of the water. These beaches also provide activities and events which range from food trucks and wine tastings to movies, music and beach sports. In Canada, these beaches can provide opportunity for year-round events. While we may think of these spaces as only a summer venue, there are creative ways of using these spaces during the winter months as well.